Tanks came to Romania at the end of the First World War, when 75 Renault FT-17 light tanks arrived from France. At the start of the next war these still served in 2nd Armored Regiment, at least on paper. Several of them fought the Germans in 1944, and we included one sample piece in Armata Romana. The kingdom’s 1935 re-armament program included tanks, and a commission inspected tanks in several other countries before recommending spreading Romania’s purchases between French and Czech firms. Three dozen of Romania’s first tank, the Skoda AHD-IV, arrived from Czechoslovakia in 1937 along with plans and a broken-down sample to allow licensed production at the Malaxa works, a maker of agricultural tractors eventually bought out by Germany’s Hermann Goering Werke. Malaxa could not make all of the little tank’s components, and relied on imports from Skoda for many key parts. The German occupation of Czechoslovakia cut off these shipments, and no Romanian-built copies of the R-1, as the tank was known in Romania, were made. From Skoda the Armata Romana ordered 126 S-II-a light tanks, known to the Romanians as the R-2 and to the Germans as the PzKw 35(t). These needed their engines replaced, but otherwise the Romanians were satisfied and tried to purchase a further 382 of them in 1939, an order rejected by the Germans. Romania selected another Skoda vehicle as the follow-on to the R-3, the 17-ton T-22. This tank had many common components with the R-2, but thicker armor and a 47mm gun replacing the 37mm in the R-2. Hungary’s Manfred Weiss firm built the very similar T-21 under license as the Turan, and Romania wanted to keep up with its rival. But the Germans denied the license application, officially because Romania had not joined the Axis, in reality because Romania’s role in the New Order would be as a supplier of raw materials to German industry, not as a future competitor. Romanian military theory followed French practice in dividing tanks between cavalry and infantry vehicles. The Skoda vehicles would perform the cavalry tasks of screening and pursuit; slower tanks with thicker armor would accompany the foot soldiers. A French tank was chosen for the infantry support role. Renault proved willing to fulfill Romania’s desire to build a tank factory, along with a license for 200 R-35 infantry support tanks. Negotiations opened in December 1937 and at first seemed promising. But the French economy suffered from the Great Depression longer than the rest of Europe, and the government would not allow Renault to export tools and machinery to Romania while the French Army’s own orders went unfilled. And like other French manufacturers, Renault used outdated methods and work rules, slowing production and making it difficult to divert equipment to the Romanian venture. 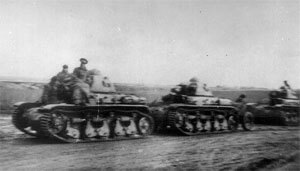 R-35 tanks in Romanian service, 1941. Denied their tank factory, the Romanians instead bought 41 completed R-35s in 1939, and acquired 34 more ex-Polish vehicles later that year when the Polish 305th Tank Battalion brought its vehicles over the Romanian border. The fact that Renault was allowed to sell complete tanks implies that the French government, like the Germans, was primarily interested in maintaining Romanian dependence on foreign suppliers. Some Romanian generals had hoped to build the Somua S-35 cavalry tank, considered the best tank available in the late 1930s, instead of the R-35. But a cavalry tank had already been purchased, and Somua was not as accommodating as Renault. The Somua had a highly sophisticated cast hull and turret, something beyond most plants making tanks in the late 1930s. In 1940, German interests bought into many Romanian firms. This did not make it any easier to obtain licenses for German weaponry; if anything, Romania now had a harder time producing modern arms as German owners looked to their own profitability first. Had the Renault deal been completed, the odds of obtaining a more useful German model to produce in it would still have been slim. Two intact T-34/76 tanks fell into Romanian hands during the 1941 campaign. Ion Antonescu, Romania’s military dictator, appears to have noted the tank’s huge technical superiority well before any German senior leader. Antonescu directed the army’s experts to reverse-engineer the T-34/76 as quickly as possible and begin production at the Malaxa works. Army and Malaxa engineers had a great ability to make much from little, as the later TACAM vehicle series and Maresal tank destroyer program would show. But the T-34 project could not be executed with purely Romanian resources. No Romanian plant could manufacture high-grade armor plate, and it could not be obtained abroad. The T-34’s big 12-cylinder, 500-horsepower diesel engine also could not be easily replicated in Romania. The R2 used a 125-horsepower Skoda gasoline engine. 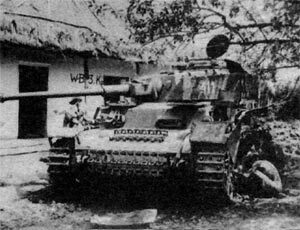 Several German firms built diesels more than powerful enough for a T-34 clone, but Germany wasn’t selling licenses to Romanian companies. The Romanians could have done what numerous tank designers did, and adapted an aircraft engine to power their tank. The IAR works in Brasov had been making aircraft engines since 1925 and in 1936 licensed a 500-horsepower radial from Gnome-Rhone and subsequently built ever more powerful engines. supplied to Romania, this one arrived in 1944 needing repairs. Finally, there was the L11 tank cannon fitted in the vehicles captured by the Romanians, upgraded later by the Soviets to a more powerful model. The Astra works had a license to make the Vickers 75mm anti-aircraft gun, and its plant could have handled either a modified version for use in the new tank, or a direct copy of the L11 gun. While a number of Soviet factories and machine shops that produced weapons were taken by the Romanians (tooling taken from one soon had a Romanian factory turning out 120mm mortars), none of these made tanks. There could be no shortcuts to cloning the T-34: Every part would have to be made in a Romanian factory. That turned out to be impossible. The Renault-built plant would not have made armor, either, but would have made the assembly job much easier. Click here to order Armata Romana and send Romanian armor into battle!